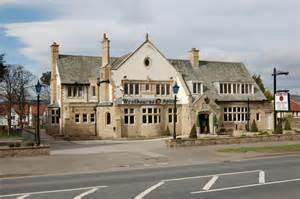 This was a purpose built Hotel in Otley and plans were approved by Otley Council in January 1938 and then built around 1940. In October 1945, Messrs. John Smith and Co. requested permission to connect the cellar drains (surface water drainage) of the Westbourne Hotel to the culvert on the Westbourne Housing Estate, on condition that the Company indemnified the Council against any future claim and damage. In February 1991, pub-goers toasted success in the fight to prevent their local being turned into an up-market eating-house. Regulars of the Westbourne Hotel claimed the national hotel and restaurant chain, Trusthouse Forte, had bowed to public pressure and agreed to scale down its original proposals so that the public and lounge bars were retained. A new application, due to be heard on March 6, omitted the major restaurant extension previously applied for, reduced the kitchen extension and retained both the public and lounge bar. An advert dated October 1993, announced that Tom Cobleigh plc were proud to announce the forthcoming opening of The Westbourne (subject to the Final Grant of the Licence) their latest “Unspoilt Pub for Nice People.” They were currently recruiting bar staff, waitresses and cleaning staff at a rate of £3.50 per hour. If one wished to apply for one of the vacancies, you had to call at the Westbourne and take a recent photograph with you!! In November 1993, the Tom Cobleigh re-opened. The company had steadily built up a reputation for the highest standards of service and hospitality and the Westbourne would be no exception. Those standards – which were acclaimed with a ‘highly commended’ rating when the company was judged runner-up to the UK Independent Pub Operator of the year 1993 – meant a range of cask beers and lagers from different brewers, home cooked food from a varied and ever-changing menu, and an atmosphere with the absence of loud music and juke boxes. More than £750,000 was invested to ensure that the Westbourne met the desires of the discerning customer. The Westbourne Pub in September 1994 was awarded the title of best Tom Cobleigh outlet in the country. Secret mystery customers who visited the pub voted it top of the company’s list of 25 regional pubs with marks of 98% for customer service, cleanliness, food and the condition of the beer. As a result, the 14 staff at the pub were to have a share in the prize of Marks and Spencers vouchers worth £500. In March 1995, the Westbourne became the first pub in Otley which could legally allow children under the age of 14 onto the premises due to being awarded a children’s certificate by Otley Magistrates. The Magistrates had recognised that they were a quality family pub. When granting the certificate, magistrates of Otley stipulated the children’s area in the Hotel should be cordoned off, would not contain any games or cigarette machines and would be a no-smoking zone. Chairman of the Bench, Mr Michael Rhodes, also insisted baby changing facilities be provided in the toilets. It was hoped these facilities would be ready by March 13th when the children’s certificate came into operation. When it opens, the children’s area will be open from 11am to 9pm Monday-Saturday and from noon to 9pm on Sundays. By 2007, the Westbourne had become an Indian Restaurant. It’s world class chef’s were expert at catering the finest Indian, Pakistani, Kashmiri and Mughlai Cuisines. In August of that year, it suffered a blow when Bradford Road was closed for several months to allow Bradford Council to carry out urgent repairs to a deteriorating culvert under the nearby Ellar Ghlyll tip. Otley & District Chamber of Trade stated that the road closure, along with the Foot and Mouth disease, were hitting local trade hard. The Indian Restaurant stated that things were so bad that the business may have to fold as he had empty tables all the time. He had spent around £300,000 and so needed to let people know that they were still open as usual and get them coming back. In 2012 the property is occupied by Westbourne Spice.